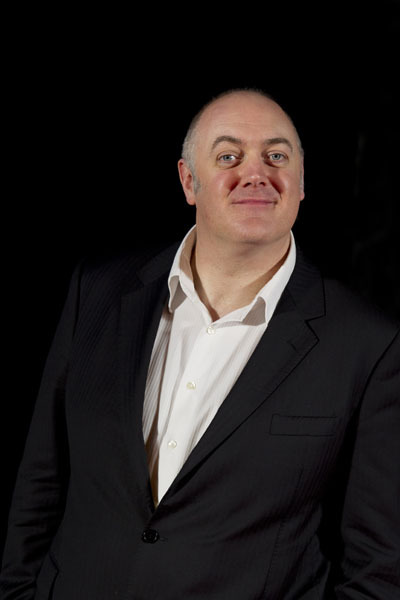 This year’s headline act at Inconnections HAC Comedy Christmas Lunch was Dara O’Briain. Do you need the Wikipedia link back there to see who he is? He does seem to be on a lot of TV programs and I’m not surprised; I think he is a very clever, funny man. His current routine includes material about having a young child which speaks directly to me. I can’t report to you any witty one liners as his show is so much the man himself and the delivery of his thoughts on life… (Oh okay, here’s a link to his official website where you can hear a few). Just before my shoot with him I had set up some lights in a crowded backstage space. As I went to move a table out of the way, a security guard came up and said he was going to throw me out if I moved it again… It reminded me that to do this job you not only have to have the skill to get everyone on your side but you have to remember to constantly see that everyone is still on your side. The security guard made a mistake but it was just before Dara walked in and it really threw me. The most important thing is those precious lead up moments to the actual shoot and it was a bit of a mental struggle to get back on track. The power of a real life TV celebrity in front of my camera made the security guard fade away, I think. I already know how important the preproduction preparation of a shoot is but I’m adding a chapter called: Constantly Check In With Everyone Who Feels They Have A Claim On The Space You Are Using. It won’t be a long chapter, it’ll have the above title and it’ll say: Constantly check in with everyone who feels they have a claim on the space you are using. Even if they are wrong they could still ruin the shoot. I once had a HiVizibody* stand in front of my camera to stop me taking pictures claiming I “could be doing hostile reconnaissance”. I wasn’t, but if ever I do embark on a career of hostile reconnaissance I’ll probably use a smaller tripod. (*I’d like to credit Andy Drysdale for coining this phrase). THA (Tables Humane Association) 2013: No tables were harmed in the making of this portrait.